Celebrate SLPs! Enter Now to Win a Freebie! Thanks for visiting Speech Spotlight! Let’s celebrate SLPs! We are in a wonderful profession. Although all SLPs have problems, you don’t have to be alone in dealing with them. 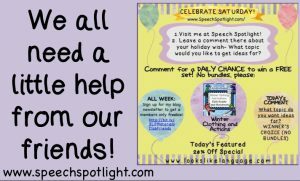 At Speech Spotlight, we can help! 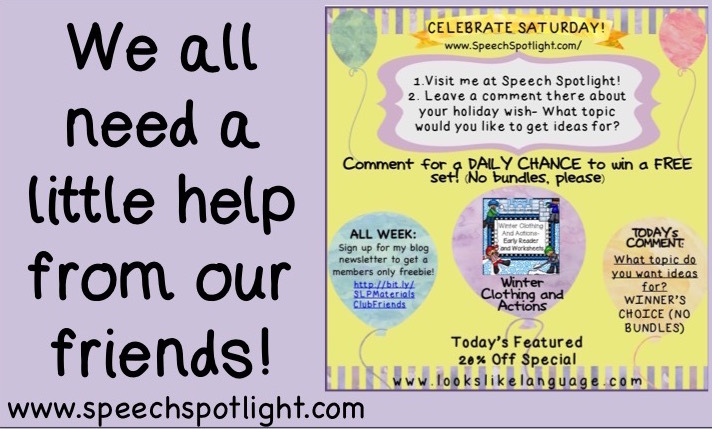 Be sure to comment to this post with an area of difficulty that you experience as an SLP. You can get some help and enter to celebrate at the same time! Who are we? 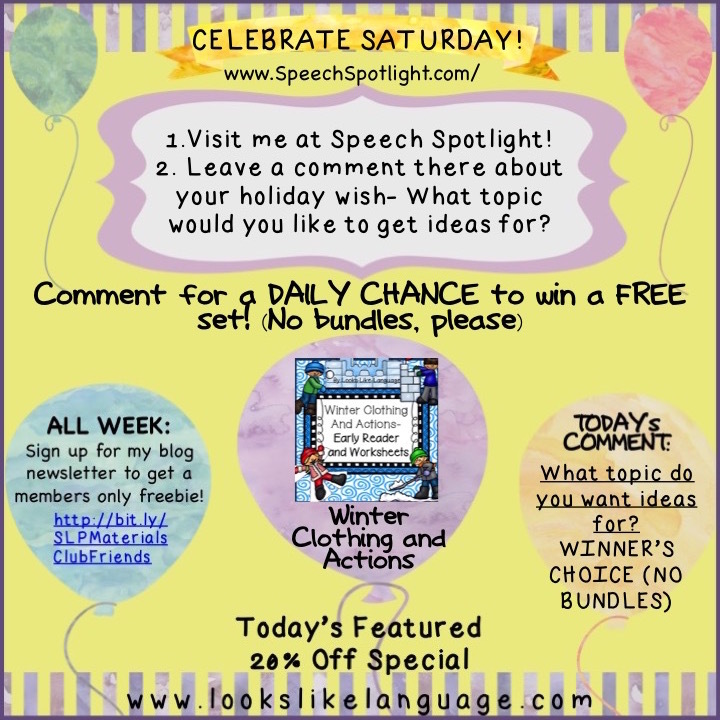 Speech Spotlight has 10 SLPs with varied backgrounds. We have joined together so that our skills and knowledge will help you in your every day speech life! You came here to get an entry in today’s contest but it is our hope that you will leave a little better off for having found a new, helpful resource! Before you enter the contest, we want you to know that we are so happy to have the SLP Materials Club members join us today. If you don’t know about the SLP Materials Club, click here. Don’t miss out on great, free materials and lots of fun any longer! 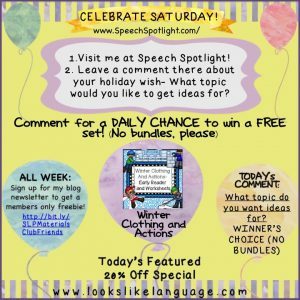 Entering the contest for today’s chance at a free product of your choice (no bundles) from Looks Like Language is super easy! Just comment below with information about your biggest difficulty or topic of interest as an SLP. We hope to help you out, either by answering your comment now or in upcoming posts. The winners will be announced tomorrow at SLP Materials Club and at Looks-Like-Language. Thanks for celebrating with us, and good luck! **The contest is now closed. Congratulations, Shane! Thanks to all of you who shared your concerns. Future posts will help you out! My biggest challenge is working with students who have fluency disorders. That’s a touch one for me, too, since I’ve done very little of it. It is a challenge but one that I love! Therefore, I may be helpful. Can you give me more direction as to what part is most challenging? Dealing with feelings and fears, understanding and teaching stuttering modification and fluency shaping techniques, finding materials to target this area? Or just fresh ideas for all of the above? With so many of us finding this area challenging, I may just approach this topic on both speechspotlight in the future and my own blog. Fluency is my favorite!! Please tell us more about what you’re struggles are within this area. I’ve started a series on my blog at http://www.sweetspeech.org called Fluency 101. I hope that will be a good place to start as a refresher for SLPs and a nice easy read for parents and teachers. Would love to have more information on working with nonverbal or minimally verbal student with cognitive deficits. Shara, that’s a population I’ve been working with for 40 years, so happy to dedicate my next post to some ideas. Activities that can cover variety of levels within a group. I need more information on working with higher level students with Autism in the K-4 population. I have difficulty with data collection in large mixing groups. My biggest difficulty is working with fluency disorders. As I posted above, fluency is my favorite!! Please tell us more about what you’re struggles are within this area (understanding how to counsel, when to choose direct vs indirect, age groups, etc). In the meantime, I’ve started a series on my blog at http://www.sweetspeech.org called Fluency 101. I hope that will be a good place to start as a refresher for SLPs and a nice easy read for parents and teachers.